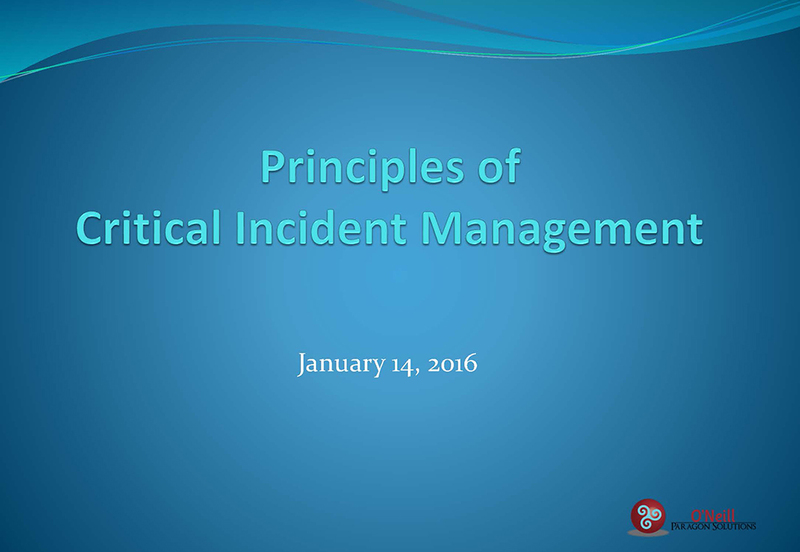 Successfully managing critical incidents can be complex and demanding. In order to learn from the successes and challenges experienced while managing a critical incident, organizations should conduct a thorough after-action review following each event. To improve individual and collective-task performances that meet or exceed best practices, leaders must know and understand what happened or did not happen during critical incident. After-action reviews (AAR) help provide feedback on process, decision-making, communication, staff support, and task performances in managing critical events to identify and correct deficiencies, sustain strengths, and focus on improved performance. This guide offers insights to leaders on how to plan, prepare, and conduct an after-action review. Key is the spirit in which AAR is conducted. The environment and climate surrounding an AAR must be one in which the stakeholders and leaders openly and honestly discuss what transpired in sufficient detail and clarity to better understand what did and did not occur and why, and, most importantly, offer the opportunity to learn from and improve management practices. An after-action review is a learning and problem-solving process that enables stakeholders to discover for themselves what happened, why it happened, how to sustain strengths and improve on weaknesses, and adopt a course of action to correct problems. It is a process leaders and managers can apply to get maximum benefit from every critical incident experience. Through an effective AAR, leaders can build on strengths and correct deficiencies by carefully evaluating and comparing overall critical incident management performance against established standards. AAR feedback compares the actual output of a process with the intended outcome. By reflecting on how a critical incident was managed against established standards, and by describing specific observations, AAR participants identify strengths and weaknesses and together decide how to improve overall performance. This shared learning improves management proficiency and promotes team development. Effective AAR may lead to changes in standard procedures, revised duties, improved communications, and focused training. After-action reviews tend to follow a general format that facilitates the exchange of ideas and observations, and focuses on improving proficiency. Conducting the AAR involves planning, coordination, preparation of training aids, appropriate venue or virtual meeting technology, and support personnel. The AAR should be conducted immediately upon the resolution of a critical event while being mindful of the psychosocial impact that the event may have had on some stakeholders. In most cases the AAR should commence within 72 hours following a critical incident. As the discussion expands and more participants add their perspectives, what really happened will become clear. Remember, this is not a critique or lecture; the discussion does not about finding fault. However, the facilitator must ensure sensitive issues are explored, even those that may be difficult for some to discuss. Skillful facilitation should ensure the AAR does not gloss over mistakes or weaknesses. This technique is logical, structured, and easy to understand. It follows the flow of events from start to finish and allows participants to see the effects of their actions on the events other stakeholders. By covering actions in the order that they occurred, participants are better able to recall what happened. Chronology of events often begins before the onset of the critical incident and should consider activities, decisions, and other exigencies that may have contributed to the incident itself. In addition to discussing key issues, the AAR facilitator might also explore several optional topics, included in the following paragraphs. Through discussion, the participants may identify critical skills/competencies that affected performance. The facilitator should note these skills/competencies to guide discussions about future training. The facilitator should understand the cultural dynamics of the group and adapt an approach that is likely to foster honest discussion among participants about the relative effectiveness of management and leadership skills/competencies applied in managing the critical event. The facilitator should note the strengths and proficiencies that are highlighted during discussions. These become the exemplars against which deficiencies can be measured. The intent is to build from strength and then focus on any deficiencies in knowledge, skills or aptitude that need improvement. The AAR report should summarize issues raised and their impact on performance, followed by an analysis of successful application of standards and procedures and specific areas for improvement. This analysis should highlight the demonstrated strengths to be sustained and built upon and describe in some detail the areas in need of improvement. The report should conclude with specific, prioritized recommendations and an action plan that specifies follow-up actions, responsible individual/department, success indicators, and timetable for implementation.